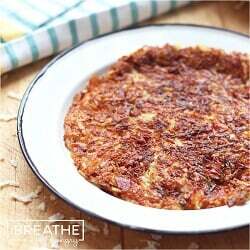 This is a delicious, crispy low carb pancake that makes a wonderful side dish to any meal, including breakfast! You can customize the flavors with other add ins too! In a 12-14 inch saute pan, fry the bacon in olive oil and butter until mostly crisp. Meanwhile combine the shredded celeriac, parsley, Parmesan cheese, salt, pepper, and garlic powder and mix well. Add the celeriac mixture to the pan with the cooked bacon in it and stir well. With the back of a large spoon, press the mixture into the bottom of the pan to form a round cake. Cook on low-medium heat for about 5 minutes or until the bottom is dark golden brown and crisp, and the top is softened. Carefully place a serving plate over your pan and flip the cake onto it crispy side up. 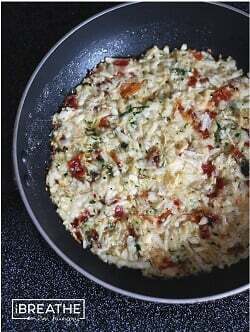 Serve hot garnished with more parsley if desired.